Your home’s energy efficiency and curb appeal are going to take a dive if your doors are in bad shape. According to the U.S. Department of Energy, your doors are one of the components of your home that can contribute to energy loss through conduction. If your doors allow air leakage, then your heating and cooling systems will have to work harder to keep your home comfortable, which increases power consumption and energy costs. Another problem with old doors is their look. The frame or the actual door can already be fading and worn-out. Replacing old doors can save you on energy costs and help restore the beauty of your exterior. Hiring experts like Renewal by Andersen® of St. Louis to install your new entry doors in St. Louis MO can be beneficial to you as a homeowner. Our team will get the exact measurements of your home to ensure that the door will fit perfectly. We will discuss with you the design and type of door that will best suit your home. We have entry doors, French doors, and patio doors in St. Louis MO. Once you and our design team agree on the door type and design, your order is going to be placed at our factory. Our craftsmen will make sure that the specific dimensions, style, shape, and finish that you requested will be followed. On the day of installation, our team will arrive on the dot and begin working. Our installation crews are efficient, tidy, and committed to finish the job in the shortest possible time with minimal interruptions. Lastly, after the job is completed, our team will clean the working area. Ensure a clear and brief process from an expert door installer. 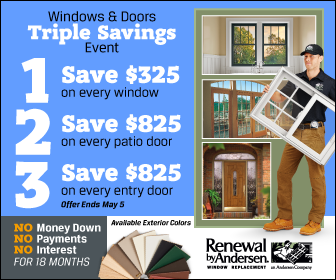 Hire only Renewal by Andersen of St. Louis for successful door installation. For more information on our replacement doors and our installation process, give us a call today.